Discussion in 'Gen 7 LC' started by E.T., Mar 3, 2017. Discuss the possibility of Meditite being banned from the SM LC tier. 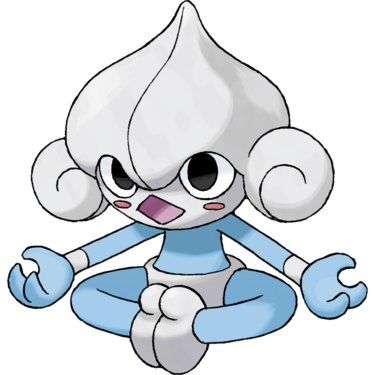 Use this thread to discuss Meditite’s effect on the metagame. Talk about the different sets it can use, possible partners and team support, and potential checks and counters. State your opinion on whether you think it should be banned or if it should stay in SM LC. All opinions are valid, and discussion amongst players is not only allowed but encouraged, provided your judgment is backed with sound reasoning and validation coming from experience having played with / against Meditite in the tier. Do not simply say "it's broken" or "it's not broken”, and do not make arguments via theorymoning. Recently doing tryouts with some of my friends so I can pick my LC players for POWC based on some basic knowledge of it. And I'd like to stop by and drop some input. I've not played too many games since the ladder is totally dead and I just battled very few people privately. Simply put, the ability Pure Power boosts Meditite to some insane 28 (Adament) or 26 (Jolly) without any item or stat boost, making it simply the best straightforward wall-breaker in LC. It has a really good movepool: Hi Jump Kick, Drain Punch, Zen Headbutt, Fake Out and Bullet Punch. Drain Punch makes it quite hard to wear down and Fake/Bullet gives it priority. It also learns Thunder Punch, Ice Punch and Fire punch. I think the most reliable checks for it in the past was slowpoke and frillish but both having trouble with thunder punch. Technically we get nothing new this gen that can switch into it, even you give your mudbray almost full EV on Physical Def side it still get 2HKOed by the HJK variant lol. Its speed is a middle tier I would say, and the bulk is not that good (paried with Eviolite makes it good enough) but that is not troubling its insane wall-breaking ability, after all. I've heard of the scarf set and Bulk Up but I don't really know much about them so I won't comment on them. The Life orb HJK is insane and no one really stops it safely, and the most standard eviolite set is really effective too. The combination of its power and movepool proves it to be too good a wallbreaker for LC. I was talking about this with Heysup, and while Meditite is certainly manageable, it's not pleasant to deal with at all. It's astounding power combined with its excellent coverage means that it's hitting everything pretty damn hard. Other than some crappy Psychics, there's not much that wants to come in on any of its attacks. On top of that, its coverage means that you're probably playing a life-or-death 50/50 every time it's in. I'll admit it isn't the bulkiest though, and it's not the fastest, but both of those can be alleviated. While it's not the only Pokemon with power like that, what makes it such a threat is its amazing typing in combination with its specific moves. Personally, I'm not a big fan of sets other than Eviolite, but they're all possibilities which makes it so much harder to deal with. You have to know what all four of its moves are before you can properly fight it and by the time you get to that point your team's been broken apart by it. Also, Torchpass. I don't think I need to explain the hell that creates. Bouncing off Quote. here, I'm no fan of non-Eviolite sets either. It could use all the bulk it has, considering how it has such a strong STAB HJK and Zen Headbutt followed by two coverage which could anything from Bullet Punch, Fake Out, Ice Punch, heck even Thunder Punch. Potential Pokemon that can KO Medi like Doduo, Vullaby or Pikipek or Gastly can't switch into it safely without risking an OHKO. Only real switch in imo is lol Bronzor which isn't something I won't suggest using tbh. It's an extremely good wallbreaker to have graced LC and I believe it needs to go. Also LOL E.T. why is BP still allowed in LC? e: I might need to make a post on the discussion thread tbh on this is cause pretty off topic. Sorry lmao. As the reasoning presented in this thread explains, Meditite's raw power combined with a handy movepool simply causes it to be too overwhelming. Meditite will be banned from SM LC.